Vania came to Armenia in 2014, after moving to Lebanon to flee the conflict in Syria. 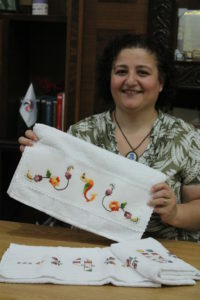 For the past 20 years, she has been making handmade embroidery as a hobby, but did not have a business established back in Syria. 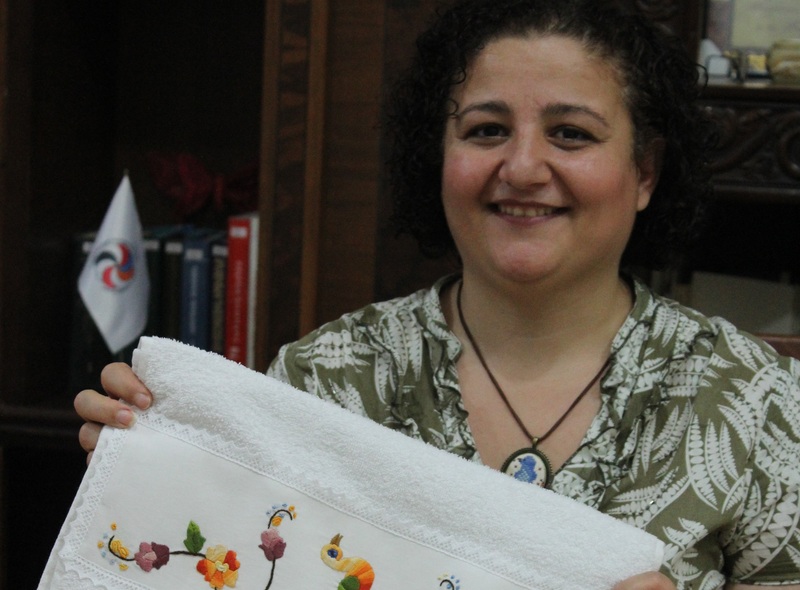 After moving to Lebanon, her business venture slowly took off, but it was in Armenia that she launched her official online marketplace, Vanart Handmades. In order to help make her business grow and succeed, Vania knew she would need to advance her English skills. When she saw Aleppo Compatriotic Charitable Organization’s (Aleppo-NGO) announcement on the “Yerevan MOOC Camp Coursera for Refugees” project, she knew it was an opportunity she had to take. She took English for Business and Entrepreneurship course provided by the Pennsylvania State University through the project. The course helped her to both generally advance her English and to learn the necessary business language to communicate with her investors and customers. Vania said she liked the simplicity of the course, and that “it was also a fun way to learn because there were engaging quizzes and games”. Through the skills she has learned so far, she is able to communicate with her customers online, and she hopes to begin working on a business plan to present to the investors. Vania hopes to one day open her own physical store where she can sell her handmade goods and knows that the skills she has learned through the “Yerevan MOOC Camp Coursera for Refugees” project will be vital in reaching that goal. Aleppo-NGO implemented “Yerevan MOOC Camp: Coursera for Refugees” project funded by the U.S. Embassy in Armenia. The objective of the educational project was to improve Business English skills among Syrians, other displaced persons, and locals, as well as to contribute to their socio-economic involvement in the civic life in Armenia. The participants have been enrolled in various Business English courses (Basic Business English, Business English, and English for Business and Entrepreneurship) conducted by the world’s best universities through the Coursera online education system. Upon successful completion, the participants received certificates.